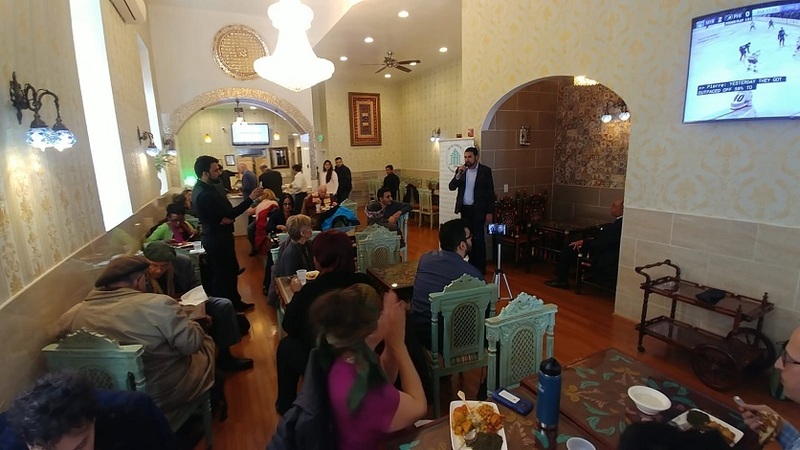 On March 31st, Rumi Forum organized the Food and Faith Event at Sakina Halal Grill. Food and Faith both bring people together. Faith traditions have a specific relationship with food. Whether it be the role food plays in daily life or providing food to the needy, faith traditions recognize this necessity as something more. Rev. Canon Leonard L. Hamlin, Sr. began his tenure at the Washington National Cathedral in April 2018. In his role as Canon Missioner, Dr. Hamlin oversees the Cathedral’s outreach and social justice initiatives. Prior to his arrival at the Cathedral, Dr. Hamlin served as the Pastor of Macedonia Baptist Church in Arlington, VA for 22 years. Dr. Hamlin received his Bachelor of Business Administration Degree (1983) from the Howard University School of Business, Master of Divinity Degree (1994), and a Doctor of Ministry Degree from the Howard University School of Divinity (1996). He has served and been appointed to numerous community, faith-based and governmental boards, commissions, agencies. Dr. Zulfiqar A. Kazmi is the founder and Executive Director of The Commongrounds USA. This organizational network is dedicated to the promotion of peace through educational programs, workshops, conferences, and research. Dr. Kazmi participated and lectured in more than 200 World Peace Conferences including UN cosponsored seminars, symposiums and convocations. He launched Scandinavian Peace initiatives and convened a series of seminars at The Washington Times. Dr. Kazmi made history offering special prayers and Salaat ul Maghrib during the last Christmas Dinner hosted by President Obama and First Lady at The White House. He is the recipient of the Fairfax County Proclamation 1998. In 2007 he achieved a nomination for America’s highest Civil Award “Benjamin Franklin Award”. Jodi Balis RD has worked for 15 years in community and public health in the non-profit sector as a culinary educator, dietitian and Nutrition Director, where she implemented cooking and wellness programs for underserved communities in the DC region, and worked to ensure access to healthy food. Jodi recently pivoted in her career, and is now a personal chef, culinary educator, body worker and ritual facilitator. Jodi co-creates Food Rituals with groups and individuals, which is a visual meditation and embodiment practice that marks milestone moments in life through the collaborative and artful arrangement of vibrant colorful food, herbs, spices and stones. Jodi is also creator and host of the podcast Purple Honey, a gathering of female voices, where Jewish wisdom and feminine spirituality are explored through the lense of health and wellness.